Short and sweet…News. Releases. Interviews. New York, NY (March 16, 2011) – All American Anthemic rockers, Drowning Pool are three shows in on their headlining tour and have begun strong by playing to packed crowds. Supporting hit singles “Feel Like I Do” and “Turn So Cold” from their self-titled studio album (Drowning Pool via Eleven Seven Music), this is the band’s first headlining tour since their successful run with Godsmack. Pop Evil will be joining the US trek as direct support starting tonight in Farmington, NM and Anew Revolution, Trust Co. and Static Cycle will continue to round out the bill through the end of April (Please see below for a list of tour dates). Tickets are on sale now and can be purchased at www.drowningpool.com. Drowning Pool turned the world into believers with their breakthrough single “Bodies” in 2001. Ten years, three singers and four albums later, they’re giving fans a new reason to believe. “Feel Like I Do,” the lead single from their self-titled fourth studio release [Eleven Seven Music], became the band’s biggest radio hit to date, reaching No. 2 at Active Rock Radio, and remaining in the Top 5 for 12-weeks. With 2009’s “37 Stitches” off of Full Circlereaching #4 at Active Rock and “Feel Like I Do,” the band had 2 consecutive Top 5 Active Rock smashes and cemented their place as one of the top hard rock acts today. Recent successes have paved the way for unique opportunities such as presenting the Lane Evans Mental Health Care Reform to then-senator Barack Obama on Capitol Hill, performing for our troops all over the world and partnering with organizations like The Wounded Warrior Project and the G.I. Film Festival. 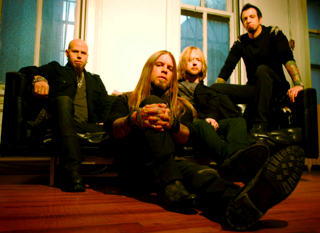 DROWNING POOL is: Ryan McCombs-vocals, CJ Pierce-guitar, Stevie Benton-bass and Mike Luce-drums. For more information on Drowning Pool and updated tour dates, please visit:www.drowningpool.com. Subscribe to The Rock Tribune!